History, culture, and natural beauty perhaps best describe the essence of vacationing in Germany. With its many historic cities and small towns, along with an abundance of forests and mountains, visitors are spoiled for choice when it comes to choosing a unique place to visit. Those wanting to sightsee or experience the arts should head to the metropolitan areas such as Munich, Frankfurt, or Hamburg, while those looking for recreational activities should visit places such as the Bavarian Alps, the Black Forest, or the Rhine Valley. Lovely old cathedrals and grand palaces are everywhere, and in the smaller towns and villages - some with their original medieval Old Towns still intact - many centuries-old traditions, including traditional Christmas markets, festivals, and fairs, continue to this day. At the cultural heart of Germany is the capital, Berlin, home to many fine museums and galleries, while nature lovers will find a world of possibilities in Germany's great outdoors. 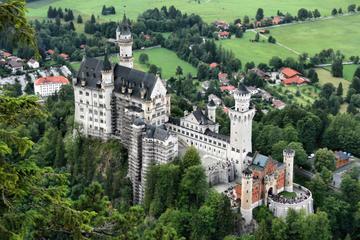 For ideas to help plan your travels, read our list of the top tourist attractions in Germany. Modeled on the Acropolis in Athens and built for King Frederick William II in 1791, the monumental sandstone Brandenburg Gate in Berlin's Mitte district was the city's first Neoclassical structure. Measuring an impressive 26 meters in height - including the Quadriga, the spectacular four-horse chariot carrying the goddess of victory perched atop - its six huge columns on each side of the structure form five impressive passages: four were used by regular traffic, while the center was reserved for the royal carriages. Huge Doric columns also decorate the two buildings at each side of the Gate, once used by toll-collectors and guards. Undoubtedly Berlin's most iconic structure, it's hard to believe that the majestic structure you see today was severely damaged during WWII and was also once part of the infamous Berlin Wall and, for a few decades, was symbolic of the division of Berlin into East and West. The towering Cologne Cathedral (Kölner Dom) - the Cathedral of St. Peter and St. Mary - is located on the banks of the Rhine and is undoubtedly Cologne's most impressive landmark. This masterpiece of High Gothic architecture, one of the largest cathedrals in Europe, was begun in 1248 and was the most ambitious building project of the Middle Ages. As imposing as its façade, its magnificent interior covers an area of 6,166 square meters and boasts 56 huge pillars. Above the high altar is the Reliquary of the Three Kings, a 12th-century work of art in gold that was designed by Nicholas of Verdun to house the relics of the Three Kings brought here from Milan. The beautiful Black Forest with its dark, densely-wooded hills is one of the most visited upland regions in all of Europe. Situated in the southwestern corner of Germany and extending 160 kilometers from Pforzheim in the north to Waldshut on the High Rhine in the south, it's a hiker's heaven. On the west side, it descends steeply to the Rhine, crossed by lush valleys, while on the east, it slopes more gently down to the upper Neckar and Danube valleys. Popular spots include Germany's oldest ski area at Todtnau, the magnificent spa facilities of Baden-Baden, and the attractive resort of Bad Liebenzell. Other highlights include the spectacular Black Forest Railway centered on Triberg with its famous falls, and Triberg itself, home to the Black Forest Open Air Museum. The best way to catch them all? Grab a map of the Black Forest Panoramic Route, a 70-kilometer driving tour that takes in the very best views over the region, along with its top historic attractions, including stunning castles and numerous medieval towns and villages. The quaint old town of Füssen, situated between the Ammergau and Allgäu Alps and a popular alpine resort and winter sports center, is a good base from which to explore nearby Neuschwanstein Castle, one of Europe's most famous (and picturesque) royal castles. 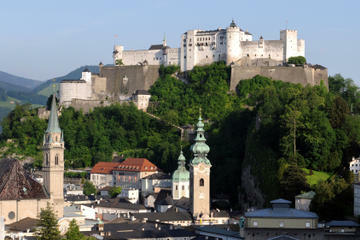 King Ludwig II of Bavaria built this many-towered and battlement-covered fantasy fortress - the inspiration for Walt Disney's famous theme park castles - from 1869-86. A variety of tour options are offered, including guided tours of the sumptuous interior taking in the Throne Room, the Singers' Hall... and some of the country's most spectacular views. In the heart of the historic Port of Hamburg, the magnificent Miniatur Wunderland, the world's largest model railway, is an attraction that appeals equally to young and old alike. Boasting more than 12,000 meters of track, this massive scale model includes sections dedicated to the USA, England, and Scandinavia (as well as Hamburg) and incorporates 890 trains, more than 300,000 lights, and in excess of 200,000 human figures. It's not unheard of for guests to spend many hours exploring this fascinating world with its remarkably detailed miniature airports (and planes that actually take off), crowded cities, quaint rural scenes, and bustling harbors. For a memorable experience, book one of the behind-the-scenes tours, an especially fun thing to do at night. Speaking of harbors, be sure to explore the vast Port of Hamburg while you're there. Covering 100 square kilometers, this huge tidal harbor - one of the world's largest cruise ship terminals, and known as the Gateway to Germany - is best explored by boat. Afterwards, visit the harborside promenade, a lovely pedestrian route, and the Warehouse District with its continuous lines of tall brick-built warehouses. The Rhine is not only Europe's most important waterway, its also the most beautiful. With a total length of 1,320 kilometers, this magnificent river stretches from Switzerland through Germany all the way to the Netherlands. While there are many places in Germany to enjoy this majestic river, the lovely Upper Middle Rhine Valley section - designated a UNESCO World heritage Site - is probably the most popular spot for tourists to visit. Here, this often dramatic 65-kilometer stretch of river boasts more than 40 castles and some 60 picturesque medieval towns all just waiting to be explored either by river cruise or by car. Looking for a great place to begin your Rhine Valley adventure? The historic town of Bingen, where the river cuts through a deep gorge before entering the Bacharach valley, is a good place to start. Berlin's world-famous Museumsinsel, or Museum Island, lies between the River Spree and the Kupfergraben - a 400-meter-long canal off the river - and includes many of the city's oldest and most important museums. The heart of this pedestrian-friendly district is the Old Museum, constructed in 1830 as a place to exhibit the royal treasures. Soon after, the land behind the museum was set aside for art and the "knowledge of antiquity." Between 1843-55 the New Museum took shape, and the National Gallery was added in 1876, along with the Bode Museum, built in 1904 and home to collections of antiquities. Another highlight of a walking tour of these spectacular points of interest is the Pergamon with its recreated historic buildings from the Middle East. But be warned: there's so much to see among these amazing museums that you can't possibly cram it all into a single day. Located in the valley of the Regnitz, where the river divides into two arms, Bamberg, the old imperial city and the most important town in Upper Franconia, is one of the best preserved of Germany's many charming old towns and one of the best to explore on foot. Your walking tour should begin in its old episcopal quarter, home to the 13th-century cathedral and the old Benedictine abbey of Michaelsberg. It's between the two river branches that you'll find spectacular Bürgerstadt, a small borough of Bamberg that contains the Grüner Markt, an excellent pedestrian zone, which is home to the 17th-century Baroque church of St. Martin and, to the north, the New Town Hall, or Neues Rathaus, built in 1736. Perhaps the town's most important structure, however, is the Old Town Hall, built on top of the Obere Brücke (Upper Bridge). Part of the Wetterstein mountain range, the Zugspitze massif straddles the frontier between Germany and Austria and is surrounded by steep valleys. The eastern summit, at 2,962 meters, is crowned by a gilded cross and can be reached by the Bayerische Zugspitzbahn, a cog railway, or by cable car. Another great way to enjoy this area of outstanding natural beauty is aboard the Tiroler Zugspitzbahn, a railway that runs to the Zugspitzkamm station at 2,805 meters. From here, the journey can be continued via a cable car to Zugspitz-Westgipfel Station at 2,950 meters (be sure to sample a meal at the excellent panoramic restaurant located here). A highlight of the journey is the chance to walk through an 800-meter-long tunnel, complete with viewing windows, to the Schneefernerhaus station at the top of the Bavarian cog railroad, from where you can ascend the eastern summit with its viewing platforms. And, thanks to the many ski resorts located nearby, Zugspitze is a wonderful German destination to visit in winter. Rügen is the largest and most beautiful of the German Baltic islands, separated from the rest of Germany by the Strelasund and linked to the mainland town of Stralsund by a causeway. The island's beauty stems from its diversity of landscape, including everything from flat farmland and forest-covered hills to expansive sandy beaches, lagoons, and lovely peninsulas. A fun thing to do here, especially for outdoor enthusiasts, is to pay a visit to the Jasmund Peninsula, which in places reaches heights of 161 meters. Here, you'll find Jasmund National Park, popular among nature lovers for its abundance of wildlife, with notable species found here, including rare white-tailed eagles. Another draw are the island's beautiful Stubnitz beech forests, part of Königsstuhl National Park. One of the most dramatic parts of the island's scenery can be enjoyed where these dense old forests come to a dramatic end on the Königsstuhl (King's Chair), a sheer chalk cliff plunges down to the sea from a height of 117 meters. There's also a great visitor center here, which offers plenty of valuable information regarding all aspects of the island. Another must see is the little old resort town of Putbus, seat of the Princes of Putbus and with numerous Neoclassical buildings and parks. The lovely Bavarian lake of Königssee is one of the great beauty spots of the region of Germany referred to as Berchtesgadener Land. Also known as the King's Lake, this area near Salzburg is a hiking (and biking) paradise thanks to its vast network of trails. One of the most popular things to do is follow the attractive footpath located along the east side of the Königssee to the Malerwinkel, or Painters' Corner, notable for its superb views over the lake and the surrounding mountains. Another equally attractive sightseeing option is taking a boat trip to the 17th-century Pilgrimage Chapel of St. Bartholomew, at the south end of the lake, and to walk from here to the Obersee. Berchtesgaden, at the end of the Deutsche Alpenstrasse, is perhaps the best-known tourist town and one of the most popular mountain resorts in the Bavarian Alps. Also of note here is Berchtesgaden National Park, a place of outstanding natural beauty that has, since 1990, been designated a UNESCO Word Heritage Site. The old Franconian imperial city of Rothenburg, one of the most attractive places on Germany's famous Romantic Road tourist route, lies on the steep banks of the picturesque River Tauber. With its walls and towers untouched since the Thirty Years War of 1618, this completely preserved picture-perfect medieval town offers endless charm. One of the most popular things to do here is to join a walking tour (or do it yourself); get started by picking up a map from one of the tourism offices located in the town. There are no end of opportunities to explore, with individual buildings of note include the imposing 13th-century Town Hall (Rathaus); the wonderful Ratstrinkstube, or Council Tavern, built in 1466 with its interesting clock; St.-Georgs-Brunnen fountain, built in 1608 near the end of Herrngasse; St. James's Church, with its fine high altar dating from 1466; and the Imperial City Museum. Simply walking the old streets past these beautiful buildings is a timeless experience, especially if it involves the Plönlein, one of the town's most picturesque spots. And after all that adventure, end your visit at one of the many fine restaurants dotted around the town. If traveling in winter, be sure to include a stop here for the traditional Christmas Market, which draws crowds from across the country (and even farther afield). Spectacular Sanssouci Park, laid out between 1744 and 1756, is considered the most celebrated example of Potsdam Rococo. Reflecting the personal influence of Frederick the Great, the park includes a lovely Baroque flower garden, more than 3,000 fruit trees, and numerous greenhouses. It's a pleasure strolling around this huge park, especially the straight-as-an-arrow, two-and-a-half-kilometer-long avenue, shielded on each side by trimmed hedges, perfect lawns, and gorgeous gardens. A number of park buildings are worth exploring, too, in particular the Picture Gallery with its many works of art; the exquisite Chinese House, an extremely elaborate garden pavilion; and the wonderful Roman Baths complex. Sanssouci Palace itself, a single-story Rococo building with an elliptical dome in the center and a circular room at each end, is notable for its spectacular interior decor, especially evident in its large oval Marble Hall and sumptuous apartments. Insel Mainau, the spectacular Flower Island on beautiful Lake Constance, covers an area of 110 acres and attracts many visitors to its beautiful parks and gardens, luxuriant with semitropical and tropical vegetation. Access to the island is by boat, or via a pedestrian bridge connecting it to the mainland, so be sure to allow a little extra travel time in addition to the two or more hours needed to properly explore this stunning property (ample public parking is available on the mainland, some with electric vehicle charging stations). Another highlight is the 18th-century Schloss, notable for its lovely White Hall, the old defensive tower, and the gatehouse. While not exactly the most picturesque of places, the Berlin Wall - or what's left of it - is one of those attractions that any visitor to Berlin simply must see. Built in 1961, the wall was the most visible manifestation of the Cold War mentality that existed after WWII, and by the time it was torn down in 1990, it extended some 155 kilometers. Thankfully, all that remains of the wall today are small graffiti-covered sections, stark reminders of the more than 70 people who died trying to escape from the East. Sections of preserved wall include a short stretch at infamous Checkpoint Charlie, as well as a section at Humboldthafen opposite the Reichstag Building on which the victims of the wall are listed. Also of note is the excellent Berlin Wall Exhibition, with its permanent exhibits relating to the Berlin Wall, and the Berlin Wall Memorial.